Retail Activism. Now, there is a phrase that instantly makes you feel guilty. Should you embrace the movement and risk look like a lightweight? Or worse, should you dismiss your credit card as a world-saving tool and zero in on cheap, cheaper, cheapest? After all, the only activism you should be involved in during shopping is trying to prevent the stores from suckering poor, innocent customers. Right? Well, if you are like me, shopping is no fun at all. You buy things, you hate them the moment you come home and feel terrible about the whole episode. Which is why I look for things that alleviate my guilt, allow me to think my cash can make a difference. I admit, retail activism appeals to me. One label that I actively look for is Fair Trade International‘s colorful label. The fair trade initiative possibly represents the first mass movement of retail activism. It aims to provide producers in developing countries with a fair price for their products, backed by customers in developed countries who are willing to pay a premium (The global Charter can be found here). 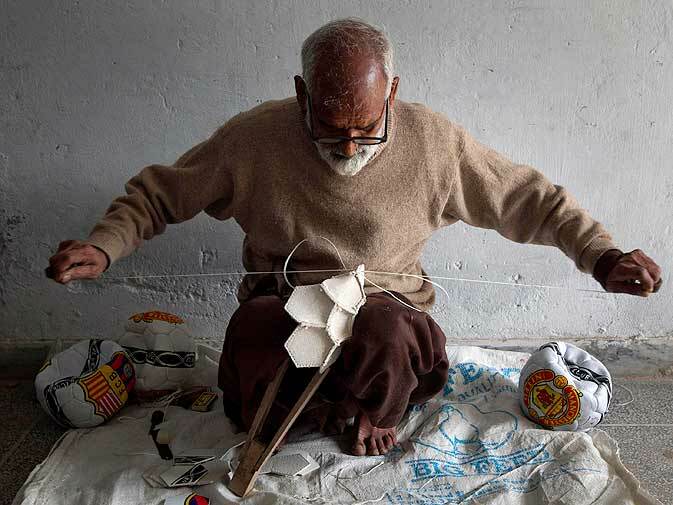 It began as a modest attempt in The Netherlands to promote handicrafts that were sourced directly from artisans. With total global sales of $4.12 billion in 2008, today Fair Trade is commonly associated with agricultural produce, coffee and cocoa taking center stage. Although fairly traded products command a very small share in the global agro-market, estimated to be less that 1% of total trade, they support nearly 7.5 million producers worldwide. That is reason enough to spend top dollar for a cup of coffee. What does is a fair trade premium translate into at the level of the producer? According to TransFair USA, equitable trade has produced about $200 million in additional income for farmer and producer organizations since 1998. In addition, a premium over the fair price is invested in community development projects. For example, buyers pay banana organizations a premium of one dollar per box in addition to paying the Fair Trade minimum price for each box of bananas. Producers have used these funds in educational and health programs or as a revolving credit fund for workers (Impact reports from TransFair USA are available here). Most community resemble El Guabo in Ecuador, where a co-operative of farmers grew from 14 in 1998 to 450. In 2009, this group exported 40 containers of certified bananas every week. The co-op members voted to spend 80% of the Fair Trade premium on education, health care, environmental projects and other social programs. The remaining 20% is spent on infrastructure improvements such as packing stations and warehouses. Today, El Guabo is giving back to the greater community by sharing their highly successful co-operative model with other producer groups in Ecuador and throughout the world (sic). On the other side of the world is Sialkot, Pakistan, a bustling economic powerhouse in a largely poverty stricken country. The Federation of Pakistan’s Chamber of Commerce and Industry (FPCCI) estimates that the average income in the area $1370/annum, almost twice the national average. 95% of the town is electrified and at 59% literacy rate, it is one of the most educated in the country. What do Sialkot and El Guabo have in common? One of the first steps to securing worker rights began with banning child labor. In the past,workers were allowed to take the panels home and complete the task for the day, which led to children being used to complete the stitching. Following an international outcry, the Sialkot Chamber of Commerce, along with the ILO and UNICEF, signed an agreement to end child labor in 1997. Soon, four of the largest sports goods manufacturers in the area committed to adopting fair trade principles, ensuring just wages, investments in community development and special emphasis on empowering women workers. As someone mildly interested in sports, I was curious. Do sports fans in developed countries care about who makes their footballs? Would they shell out $50+ for a ball they will kick around a few times and then lay it to rest in the garage? Big Box retail (you know who I am talking about) carries a soccer ball for $12. How does a company like Fair Trade Sports (now Senda Athletics) in Seattle, WA, convince people to part with their money? Senda is a small sports goods supplier in a universe populated by giants. Think Nike, Adidas, Spalding and Wilson. Fair Trade Sports offers products, under the brand name Respect, these biggies haven’t yet gotten around to promoting- eco-friendly, sustainable, fair trade balls. Eco-friendly for the organic rubber bladder sourced from plantations in Sri Lanka and India, fair trade for the hand-stitched Sialkot products (their eco-friendliness is marred by the long-distance supply chains, methinks). The company is yet to break even (based on their website), but with a revenue of $400, 000+(2007 figures, safely assume ++ in 2011), they probably sell 10,000+ balls a year. 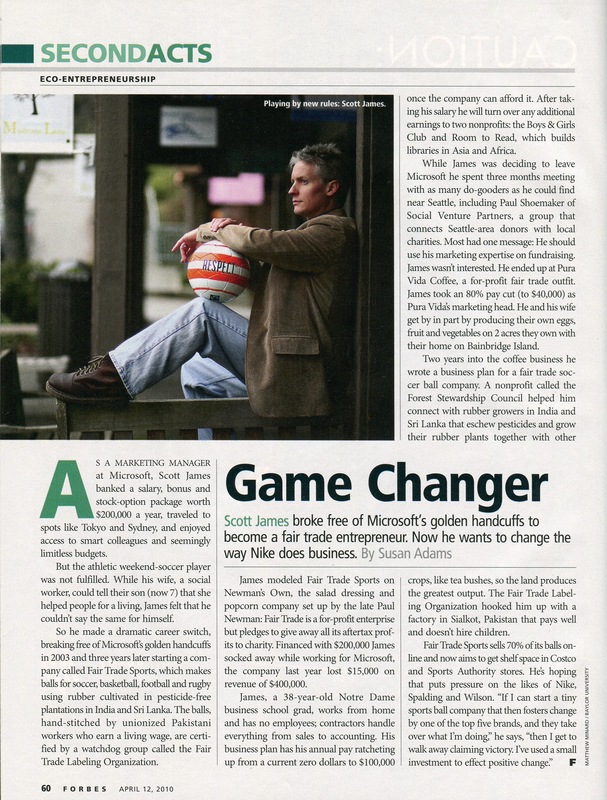 Still, as founder Scott James puts it, “If I can start a tiny sports ball company that then foster change by one of the top five brands, and they take over what I’m doing , then I get to walk away claiming victory”. I Respect that.